With the end of the holiday season and New Years nearly upon us, that means it’s time for the biannual JayLee Photography Boudoir Marathon! Just in time for Valentine’s Day, I’m throwing the biggest boudoir party yet in a new location that I am so excited to photograph your lovely faces in. Sessions include one hour of shoot time with me at a sleek Pioneer Square loft, professional make-up by one of our favorite artists, as well as 20-25 fully finished digital images and a $100 print credit. Sample products will be available at the shoot and include albums, little black books, boxes of prints and more. Oh, and there may or may not be champagne. All for the super-low rate of $500. And yes, there are some pretty awesome discounts and hook-ups if you bring your friends, so why not make it a girls day? Do it for your person or do it for yourself. Just do it. Spaces are limited, and a 50% deposit is all it takes to lock in your spot. Questions? I’ve got your answers. Just shoot me an email so I can tell you how awesome you’re gonna be and how much you’re gonna rock this shoot. Because you are. Trust me. 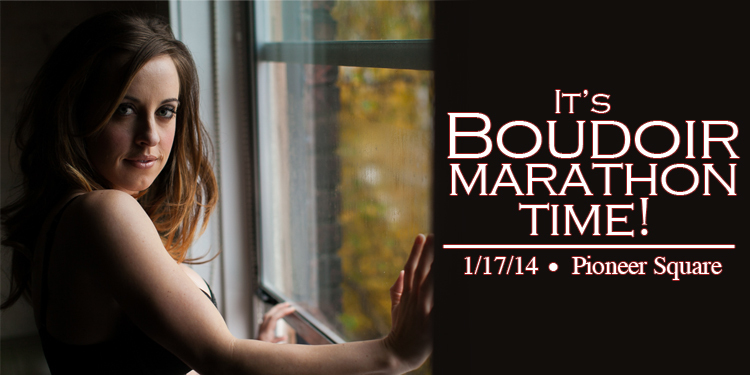 Did you know we offer boudoir sessions? As boudoir is very personal, we always ask permission before sharing any images. This lovely lady was kind enough to allow me to share some faceless-frames from her session. Maybe it's something you've considered (as a groom's gift or holiday present, to document your rockin' bod, or just for you) and you are still feeling a little shy about it. Never have I shot a session and had someone wish they hadn't gone through with it... and it's a lot more relaxed (and fun!) than you may think. After every boudoir session I get an email saying "Oh my gosh I look so great". Um...yeah, silly. You DO look great. We women are hard on ourselves no matter what we look like. We live in a world filled with body comparison, unrealistic ideas about what women should look like, and this odd idea in our heads that we could always lose one.more.pound or get a new haircut (or, or, or). I've been shooting boudoir lately for holiday gifts, which is always a fun change of pace. Here are some of my favorite shots of one of the beautiful ladies who is kindly allowing me to share her images. For a while, we had a separate website for Boudoir, but have found that our clientele is…well, the people who read this blog. So, we will be incorporating boudoir into the JayLee brand, and as we do, you will begin seeing some more sneak peeks on the blog. Boudoir sessions make great “groom’s gifts” as they are traditionally called, or special gifts for a significant other, but more than that they are fun confidence boosters. It’s also a great excuse to buy new lace-y pieces before getting all dolled up and having photos taken that highlight your beauty. Isn’t this gal stunning?